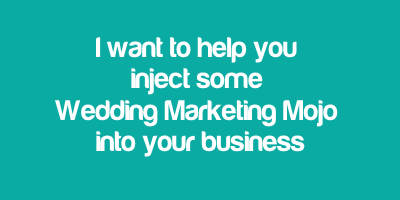 Need Some Marketing Mojo for Your Wedding Business? Calling all wedding business owners! You love your wedding business and want to make a success of it, but how do you get above the noise? How do you stand out as the best wedding business in your niche? Whether you’re delivering the dress or the dance floor, the flowers or the food, no matter how fantastic your service is, your wedding business won’t succeed if people don’t know about you – and that comes down to great marketing. But marketing is full of jargon, it’s confusing to navigate and it changes so often it’s hard to keep up! What if you could learn the latest marketing techniques, understand how to apply them to your business and be part of a supportive community? Would you bite off their hand? When I started in the wedding industry in 2002, I would have taken the hand, the arm and half the torso! As it was, I went it alone, learning along the way. How can I get the most out of social media? How do I talk about my business? Which fairs should I go to? Do I need advertising and PR? Do you ask these questions too? In 2011 I sold the business for family reasons but my hard-earned marketing experience stayed with me. I became a freelance marketing consultant helping businesses get to the top of Google and advising on blogging and social media strategy. My passion for the wedding industry never went away – in fact, for the last two years I’ve been the head judge for the North of England Wedding Awards. The creativity and enthusiasm contained within businesses like yours is matched by no other industry. 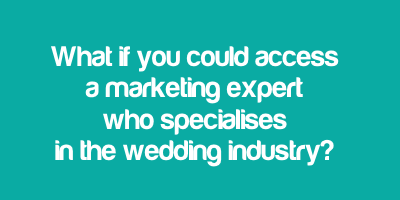 Very soon I’ll be launching an online club that will deliver proven marketing advice to your wedding business door! This advice is specifically tailored to the wedding industry. It’s straight-forward, easy to follow and results orientated – this advice and insight will tell you how to harness the right marketing techniques for your business and navigate the road to success. The Wedding Marketing Mojo Club provides definitive marketing advice for wedding businesses. It’s for people like you – established, starting up or in need of a refresh. It’s for people with a passion for their wedding business! It launches in August when you’ll be able to sign up for just £5! You’ll be able to access everything I wish I’d known and found out the hard way while running my own wedding business. 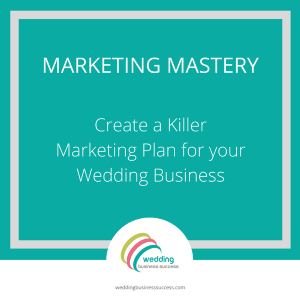 You’ll discover exactly how to effectively market your wedding business, harness the latest marketing techniques and drive your business towards success. PLUS! There’s a Facebook support group to accompany your progress and a LIVE Q&A each month where you can ask questions and get support and advice. I know you’ll enjoy being a part of this special wedding business community and learning, growing and succeeding with the support of the Wedding Marketing Mojo Club.